﻿ Friction Materials｜Brakes for Automobiles｜Product｜Products and Technologies | Akebono Brake Industry Co., Ltd.
Disc brakes and drum brakes are equipped with friction material called brake pads and brake linings, respectively. Friction materials play an important role in the brake system since brakes use friction to brake (decelerate and stop). Brake pads and brake linings are made from a blend of no less than 10 to 20 kinds of raw materials. 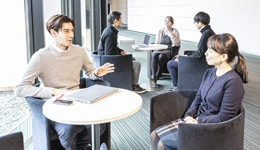 Blending the right materials for the required condition and performance is a highly complicated task requiring specialized know-how, which include leading-edge expertise of Akebono. The quality of a friction materials also change according to manufacturing process. With the development and manufacturing technologies refined over the years, Akebono offers high performance and high quality friction materials which meet our customers’ needs. We are proud to currently have approximately 46%* and 21%* shares in the Japanese and global OEM (for automobile manufacturing plants) automotive disc brake pad markets, respectively. The bonding-material hardens raw materials and gives the materials their intensity. Mainly phenol resin is used currently. The stiffener gives the friction materials further intensity. Various kinds of organic and inorganic fibers, such as aramid fibers and metal fibers, are used. The friction adjustment material mainly adjusts the effectiveness of friction materials. It is used for strengthening the effectiveness or stabilizing the performance of friction materials. Various raw materials, such as a lubricants, organic fillers, inorganic fillers, abrasive material, and metal powder, are blended as necessary. *1 Sintered alloy: The phenomena where the particles of powder material join together and turns into a solid substance by pressurizing and fabricating the powder material and heating it at temperatures below the melting point. Material that is not made by melting metal, but instead by sintering metal powders is called sintered alloy. *2 C/C composite: Carbon fiber reinforced carbon composite. Carbon composite material has been strengthened with carbon fiber. It is extremely thermally stable and lightweight. This material is often used for brake rotors and brake pads for aircraft and racing cars. Furthermore, friction materials are required to exercise stable effectiveness (minimum fluctuation of effectiveness) under varying conditions, such as vehicle speed, laden weight, or temperature change from brake usage, as well as under different environmental influences including humidity, water, and mud. Strength to withstand thermal disturbances, and mechanical strength are also important design criteria. Durability is another important property of friction materials as they wear with use. Moreover, when brakes are applied, squeal, noise and vibrations must be minimized. Furthermore, the friction materials should not cause damage to the material they get into contact, such as the disc rotors. Friction materials also require to have low thermal conductivity to prevent temperature buildup of the brakes themselves or brake oil. Akebono develops and manufactures a wide range of brake pads and brake linings, including those for automobiles, Shinkansen bullet trains, and high-performance cars for motorsports. Various types of materials are used depending on where the brakes are used. When high intensity is required for braking under high temperature and high load conditions, such as Shinkansen bullet trains travelling at speed, metallic friction materials are used. For cars used in Europe where braking from high speeds is relatively common, "low steel" friction materials are used. For passenger cars, generally "non-steel" brake pads are used because of its balanced performance between effectiveness, intensity and resistance to brake squeal. “Non-steel” brake pads are the core products of Akebono. Akebono is continuing to develop high performance brakes for the purpose of perfecting the latest brake technologies. 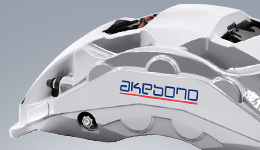 The high-performance brakes of Akebono are supplied to various motorsport teams. The expertise acquired from motorsport, which pushes the brakes to their limits, are applied to the development of brake pads and brake linings for passenger cars. For the development of friction materials, performance as well as quality that assures a long service life must be taken into consideration. 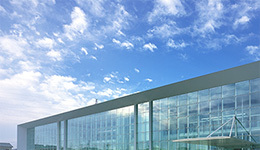 This is realized by finding the right combination of raw materials as well as by optimizing the production conditions. There are many steps that must be taken before a product is delivered to our customers. It may take a few months or even a few years to complete this process. Physical and chemical properties of friction materials are evaluated. A test instrument called the dynamometer, on which an actual brake can be fitted, is used to evaluate the friction properties. 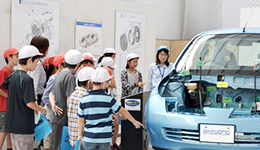 Actual cars are used to evaluate compatibility between car and brake. We are also developing raw materials which minimize environmental impact. 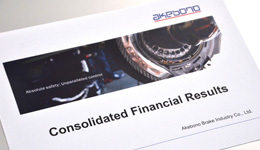 At Akebono, we are consistently striving to become experts of friction material. We have our own testing facilities with which we can evaluate basic properties from the early stages of development, up to the final evaluation stage using an actual vehicle. Friction materials are manufactured through production, inspection and testing processes before they are manufactured. In the development of friction materials where various performance requirements must be met, how to blend different raw materials effectively is one of the most important technological expertise. How the materials are manufactured also influence quality, so production technology is also important. Akebono is capable of delivering stable performance and quality with its disc brake pads thanks to its development and manufacturing technologies refined over the years. For the inspection and test processes of the friction materials, various methods are employed to check their quality. The processes include the evaluation of physical properties such as the hardness and intensity of the friction materials, as well as chemical analysis of organic materials. To test effectiveness, wear, and brake squeal, a dynamometer on which an actual brake can be installed and tested is used. To test our friction materials from the customer’s point of view, we use the "Ai-Ring” which is the largest proving ground of its kind among automotive parts manufacturers. At the "Ai-Ring" proving ground, various brake tests, from evaluations on a test bench to evaluations on an actual car, can be conducted. In the long history of developing and manufacturing friction materials, Akebono has consistently pursued the theme "safety and peace of mind." Until about the year 2000, asbestos was widely used as the raw material for friction materials because of its favorable properties for brakes, such as excellent thermal stability. In the 1970s, reports came in from overseas about the health hazards of asbestos. Immediately after, Akebono became one of the first companies in Japan to embark on the development of non-asbestos products. We led the industry in introducing non-asbestos products, and in 1992, all OEM (for automobile manufacturing plants) products for passenger cars were switched to non-asbestos. This was followed by a total shift to non-asbestos OEM products for commercial vehicles in 1994. Starting in the year 2000, production of asbestos products, including replacement parts, has been terminated. Facing environmental regulations against copper which has been used for friction materials because of its thermal stability, we embarked on the development and manufacturing of copper-free friction materials*. We have been supplying copper-free replacement parts from 2007, and OEM friction materials from 2014. Next generation technologies are also in the pipeline. Akebono is developing brake pads made from botanical resources (biomass), as well as brake pads that do not generate brake dust. * Copper free friction material: Materials with cupric content below a specified value.